Buffalo will be down another couple of receivers and one of their top cornerbacks against the Raiders high flying offense. Fortunately Marquise Goodwin will be available Sunday after leaving practice early Thursday with a wrist injury. Marcell Dareus is also ready to play on Sunday as he’ll be able to perform through an abdominal strain. Bills center Eric Wood hosted his second annual Flights and Bites event in downtown Buffalo on Monday, Oct. 17. The event, which followed the team’s big win over the San Francisco 49ers, featured many players who chose to spend their time off supporting their teammate. Coming together for a good cause, the evening consisted of both silent and live auctions to benefit the Eric Wood Foundation, which seeks to provide aid to families of sick children. The support from the Bills family proved truly tremendous, as over 30 Bills players and coaches attended the event. The turnout included, Bills general manager Doug Whaley, head coach Rex Ryan, offensive coordinator Anthony Lynn, quarterback Tyrod Taylor, safety Aaron Williams, guard Richie Incognito, defensive tackle Marcell Dareus, wide receiver Marquise Goodwin, linebacker Reggie Ragland, safety Colt Anderson, cornerback Kevon Seymour, linebacker Lorenzo Alexander, kicker Dan Carpenter, defensive tackle Kyle Williams and many more. 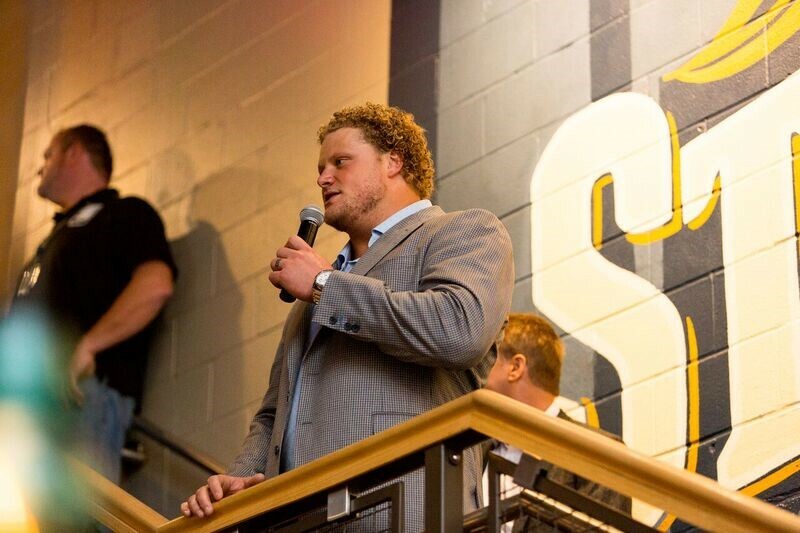 For more information on the Eric Wood Foundation, visit here. The injury list was a bit longer this week thanks mainly to illness on Wednesday, but there was another key player with a new injury. Mike Gillislee and Brandon Spikes did not practice due to illness. Marquise Goodwin fell ill during practice and was limited. Zach Brown is a new addition with a foot injury this week, but head coach Rex Ryan said he expects to have the team’s leading tackler on Sunday. There was a spirited one-on-one session in the red zone during practice Monday between receivers and defensive backs. Here’s who stood out when it came to gaining separation from the DBs. First off, there is an inherent advantage for the receivers on this drill as they have virtually the whole end zone to work with one-on-one against the DB. In fact secondary coach Tim McDonald even had a good number of his DBs play off coverage with the wideout lining up at the five-yard line. The DB would not pick him up until the goal line. That’s a tough ask. That being said the receivers who were consistently getting away from coverage were Greg Little, Robert Woods, Greg Salas and Marquise Goodwin. Goodwin’s speed is so sudden that he’s on top of the DB in a blink and they’ve got to make a decision a lot quicker than they’d like. He would quickly get position on a corner at the point of his cut and dart away for more than a few relatively easy receptions. Little again proved tough to handle in one-on-ones. His best move was when Stephon Gilmore tried to jam him at the line and his first step was backward to avoid the jam attempt. He then sold the post route so well that when he went to the corner Gilmore couldn’t make up the lost ground in time. Woods did well both when he got separation and when he was covered winning contested passes in tight coverage. His best a twisting, turning grab on a fade route. And Salas isn’t overly quick or fast, but he has great head and shoulder fakes and it helps him separate. Then he has the frame to shield the defender from the ball to make the play. He did that three times for scores on defenders in the red zone. It’s early in camp, but here’s a look at the initial candidates used in practice on kick return. On Sunday only WRs Walt Powell and Marquise Goodwin took kick return attempts during the special teams segment of practice. It’s possible there could be a rotation as camp wears on, but the pair look to be the primary candidates. Both players returned kicks for the Bills last season. Of course that could change if Reggie Bush signs knowing he’s visiting with the club today (Monday). Marquise Goodwin made it to the finals for the long jump at the US Olympic trials, but did not finish in the top three Sunday night costing him a shot to represent the US team in Rio in August. Goodwin finished seventh overall with a best jump of just over 27 feet. The three qualifiers were Jeff Henderson, Jarrion Lawson and Marquise Dendy. Henderson’s winning jump was 28 feet 2 1/4 inches. Lawson went 28 feet and 1 7/8 inches. Dendy went 27 feet 7 1/2 inches. Though disappointed Goodwin tweeted that he was thankful to God for the opportunity and his victory was overcoming the fear of losing. This also means that Goodwin will report to Bills training camp on time after missing the entire series of OTA practices and minicamp this spring while training for the long jump. Goodwin will be part of a crowded field of receivers and returners at St. John Fisher this summer including a rookie receiver in Kolby Listenbee who can match his elite speed. Goodwin’s wife, Morgan Snow Goodwin, will compete in the women’s 100-meter hurdles event on Thursday. Bills WR Marquise Goodwin cut things awfully close, but he’s in the long jump finals at the US Track and Field Olympic Trials. Goodwin placed 12th, the last qualifying position to reach the finals for the long jump. Goodwin needs to place in the top three in the finals to make the Olympic team. The finals for the long jump take place at 7:45 ET (4:45 Pacific) in Eugene, Oregon. OTAs are done, minicamp is next and then it’s just six weeks until training camp. Let’s get to your questions from email at AskChris@bills.nfl.net and on Twitter at @ChrisBrownBills. 1 – @ChrisBrownBills who do you think is going to be our rookie of the year? CB: I think the player who has the best opportunity to be rookie of the year is Reggie Ragland. With Shaq Lawson expected to miss a portion of the regular season coming off shoulder surgery it removes him as a likely candidate. Then add in the fact that Ragland is a recognized name from his widespread exposure at Alabama and that he’ll be playing a position where he can rack up a lot of statistics, and I believe the opportunity is good for Ragland’s play to stand out. 2 – @ChrisBrownBills do you see Sterling Moore as the nickel corner or will Robey keep his spot? CB: I certainly believe that Moore will be some of Robey’s stiffest competition. His time in the slot to this point has been somewhat limited, though I did see him line up there for a handful of snaps in the open practice session this week. Moore does have a size advantage on Robey at that role (who doesn’t), but Robey has near perfect technique. He has to otherwise he’s not playing in the NFL. I know the coaching staff like Robey a lot, so I think Moore would have to clearly outplay him to unseat him from that role. 3 – @ChrisBrownBills what receiver has stood out in OTA’s. CB: The receiver that has stood out the most has been second-year man Dez Lewis. He’s made a lot of plays. Now Robert Woods has made a ton of plays too in the OTAs, but I think Lewis is the biggest surprise. Lewis has added good lean muscle mass to his 6-4 frame and has not only demonstrated good ability to win on passes in traffic, but has also shown the ability to get separation. He can thank his improved route running for that. He’ll have legitimate competition in veterans like Jarrett Boykin, Greg Little and Leonard Hankerson, but so far so good for Lewis in trying to nail down a role in Buffalo’s receiving corps. CB: There are a few candidates as seems to be the case every year, but the names have changed. CB Javier Arenas and WR Walter Powell have seen the most consistent work on returns. It’s safe to say that Marquise Goodwin and Kolby Listenbee will be given opportunities on kick return when available just based on pure speed. I think Listenbee is a good bet for kick return. Punt return is a bit tougher to call only because both Arenas and Powell will be fighting for roster spots and the job may ultimately fall to someone else, like perhaps Robert Woods who has plenty of return experience. 5 – @ChrisBrownBills any chance Colin Kaepernick ends up in Buffalo? CB: I’d be a bit surprised if Kaepernick winds up in Buffalo. I realize a lot of people are trying to connect dots knowing that Kaepernick had his greatest success in the NFL under Bills offensive coordinator Greg Roman. Unless the 49ers are giving Kaepernick away and want to cover part of his salary, I don’t believe Buffalo takes a run at him. The main reason is his $11.9M cap figure. Knowing a Stephon Gilmore extension is a priority for the Bills and that an extension for Tyrod Taylor is likely if he performs as expected I can’t see Kaepernick making much business. The other reason I could see the Bills not being interested is Buffalo finally has some stability at the quarterback position with Tyrod Taylor as its starter. Adding Kaepernick would bring some uncertainty to the position in terms of depth chart hierarchy. If for some reason Taylor struggled in a game or two and Kaepernick was on the roster, fans would be calling to insert him into the lineup. Most importantly I don’t know that the Bills or any other NFL club is convinced that Kaepernick would make them decidedly better at the quarterback position. His effectiveness as a quarterback has suffered the last couple of seasons. Kaepernick’s career stats are better than Manuel’s, but his completion percentage is largely the same as EJ. I get the argument that his game could potentially be revitalized under Roman, but unless you can get him for cheap in terms of compensation and at a severely reduced salary (something Kaepernick has balked at before) I don’t know that it’s a reclamation project I’d be interested in. Whether the Bills are interested would largely hinge on what Roman believes he could accomplish with him. Bills WR Marquise Goodwin has been dedicated the last several months to qualifying for the US Olympic team’s track and field team in the long jump event. So far, so good as Goodwin has the longest jump on record this calendar year in the world. US Olympic trials are at the end of June. And while head coach Rex Ryan has supported Goodwin’s opportunity to represent his country on one of the highest athletic stages in the world, there’s no denying the receiver is doing it at a cost. Goodwin has missed all the voluntary offseason OTA practices and meetings. It’s unclear if he’ll make it in for the team’s mandatory minicamp next week, but with the commitment needed to qualify for the Olympics it wouldn’t be shocking if he was not in attendance. Ryan has said when he’s done with his Olympic commitment they’ll welcome him back. Knowing what a cut throat league the NFL is, Goodwin is smart enough to know that there are some capable speed receivers on Buffalo’s roster right now who could potentially fill one of the secondary roles in the receiving corps instead of him. Most notably sixth-round pick Kolby Listenbee. With world class speed and superior size to Goodwin, Listenbee as well as a couple of other viable competitors sit on the roster and are competing at spring practices. As for when Goodwin will return full time, it’s expected to be right after the long jump competition is over in Rio. That figures to be more than a week after training camp has started knowing opening ceremonies for the Olympics are scheduled for August 5th. A recent pair of lists complied by Sports Illustrated, indicates the world’s 50 fittest male and female athletes. The ranking of each athlete was determined by a set of six criteria which includes, strength, speed, endurance and agility. Coming in at No. 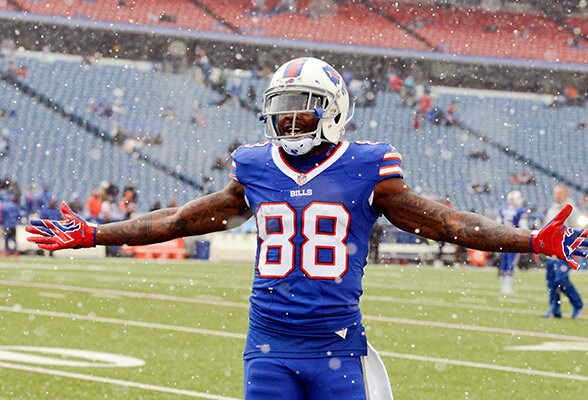 18, is non-other than Buffalo Bills wide receiver Marquise Goodwin. Alongside his position with the Bills, Goodwin excels in track and field. Recently, at the Meeting Region Guadeloupe, Goodwin posted a 2016 record in the long jump. In pursuit of joining the U.S. Olympic Team in Brazil this summer, Goodwin continues to prepare. In addition to Goodwin, several other NFL players can be found on the list. Claiming the No.1 spot as the world’s fittest male athlete is decathlete, Ashton Eaton. Bills head coach Rex Ryan is not expecting to have WR Marquise Goodwin in for voluntary offseason workouts or practices anytime soon. Mandatory minicamp might also prove difficult. With Goodwin training for the US Olympic track and field trials as a long jumper, Ryan understands the huge opportunity in front of the diminutive wideout. “Well my understanding is he has the number one jump in the world I think at this point (this year),” said Ryan. “So that is one way to represent Buffalo, our community and our football team. But you know what this is a once in a lifetime shot for a young man to get an opportunity to represent our country in the Olympics, I am certainly not going to take that opportunity away from him. The Olympics in Rio run the first two weeks of August, which is the same time as training camp. Goodwin has to make the U.S. Olympic team first. It’s a special Friday the 13th edition of Fan Friday. Let’s get to your questions from email at AskChris@bills.nfl.net and on Twitter at @ChrisBrownBills. 1 – @ChrisBrownBills will the Bills bring in a 4th QB to compete for backup position? CB: I am not anticipating a fourth quarterback coming in to compete. The main reason why is Cardale Jones needs as many reps as he can possibly get to develop consistent mechanics. From his drop backs to his throwing mechanics, Jones needs all the work he can get in the practice setting. If there’s a fourth quarterback here, every rep he takes is a rep that Jones doesn’t get. With Jones being a long-term investment I can’t see the Bills bringing in a fourth QB, who is a long shot to make the roster anyway, taking reps away from Jones on the back end of the quarterback rotation in the practice setting. 2 – @ChrisBrownBills with the Bills taking listenbee in the draft how are the chances Goodwin makes the team? CB: I think that’s a very valid question. There’s no denying that Listenbee’s speed rivals that of Goodwin. Listenbee also offers superior size and in watching his game tape is really good at tracking the deep ball. He’s coming off sports hernia surgery and also has inflammation of the pelvis, which will take time to heal. Listenbee may not be getting physical reps in the practice setting until training camp, so unseating Goodwin for a roster spot might take longer than some might anticipate. Goodwin has been given the freedom to pursue a spot on the 2016 Olympic team to try to compete in the long jump in Rio. If he makes the Olympic team it will cost him time in training camp with the Olympics taking place in August. I believe that will pose the biggest risk for Goodwin losing a roster spot than Listenbee’s presence on the roster. There are no ‘seat saves’ in the NFL. That’s a crucial part of the NFL calendar to be missing time. 3 – @ChrisBrownBills do you think the drafting of Washington means anything regarding Kyle Williams future with the team? CB: If you’re asking whether Kyle’s roster spot could be in jeopardy because Washington is on the roster my answer is no. The plan right now is for Washington to be the team’s left defensive end, with Dareus at nose tackle and Kyle starting at right defensive end. I don’t think it’s any secret that Kyle is on the back side of his career, but I think the Bills would like to get two more seasons out of him (2016 & 2017) as long as he’s interested in doing so. The hidden additional value with Kyle is his leadership, which was sorely missed in the locker room last season when he went out in Week 6 with his knee injury (see: Mario Williams). The addition of Washington should be seen as a complement to the games of Dareus and Williams, not a threat. 4 – @ChrisBrownBills Do you see the Bills making any FA/Trade moves along the right side of the offensive line? CB: I don’t think you can ever rule out a possible move with Doug Whaley as GM. If it makes sense and improves the team he’s shown he’s willing to do it. I know Peter King reported last month that the 49ers would be interested in trading former first-round pick OT Anthony Davis, who chose to take a one-year sabbatical from football, and now wants to resume his NFL career. A proven player who is just 26-years old would probably come at a high price, even after taking off a year. It would be interesting to see what the 49ers would be looking for in return, even though San Francisco GM Trent Baalke has told Davis that he is not interested in trading him. His cap hit, if his old contract was re-instated, would be just over $5M for 2016, a bargain by most standards for a player of his caliber. But that’s where things could get sticky too. If he is going to be traded, must that team negotiate a new contract with him? A lot of potential hurdles there. Besides him there are some veteran guard options out there, but I believe the Bills might play the wait and see game. I don’t believe there’s any sense of panic there. I think they feel good about what they have to work with. How do you feel about the Bills 1st round pick considering who was available? Nkemdiche for example. I feel like it was a bit of a homer pick considering Rex wore a Clemson helmet to a press conference. Do you think he was on the top of our board or was Rex being Rex? Great work as always Chris! Thanks! CB: As you saw in our Inside the Draft Room feature and video, the Bills never even thought Shaq Lawson would be available to them there at 19. They had him off the board by the 12th pick in their final stack of the board based on how they thought the first round would fall. For them Lawson was a tremendous value there at 19. As for Nkemdiche, it was evident that his off the field concerns and on the field concerns were too much for a number of teams besides the Bills. Buffalo just parted ways with a player who did not give his best on the field for the last 10 weeks of last season in Mario Williams. Did you really think they would bring in another player with a history of similar play, especially with their first-round pick? There was no way that was going to happen. Bills WR Marquise Goodwin participated in the long jump over the weekend at the Millrose Games at Madison Square Garden, one of the more notable indoor meets in the country. He finished third in the long jump. Goodwin’s jump of 25-feet, five inches earned his the third place standing. The receiver appears as though he is committed in trying to qualify for the 2016 Olympic Games in Rio. The US Track and Field Trials begin July 1st in Oregon. The Bills will be bringing a bit healthier roster to the table on Sunday against the Dolphins. Let’s hope home field advantage is a reality this week. Here are your latest edition of questions from email at AskChris@bills.nfl.net and on Twitter at @ChrisBrownBills. 1 – @ChrisBrownBills why not switch the guards to different sides? Give the youngsters more experienced neighbors. CB: I don’t think change is something most offensive coaches subscribe to with their offensive line unless it’s horrific in terms of performance, especially midseason. Based on offensive coordinator Greg Roman’s comments Thursday, about seeing things with the offense getting closer to where they want it, I think they want to push forward with what they have now that starting five are back together with Miller and Henderson returning. 2 – @ChrisBrownBills were the bills ever interested in making a move at the trade deadline? CB: I think what Doug Whaley’s short track record as GM has shown us is he’s never afraid to make a deal if he thinks it benefits the team, but from what I have been able to gather the Bills were not burning up the phones at the trade deadline this past Tuesday. I was wondering if you know of any plans of NFL or Buffalo Bills stores that will be selling the red jerseys from this week’s game? Also, will these now become an alternate going forward that the team will wear once in a while or is it a one night only kind of deal? CB: The Bills Store will have the red jerseys available in store. From what I have been told only LeSean McCoy and Sammy Watkins jerseys will be available in red. They will also have a Bills color rush hat, sweatshirt and T-shirt available with the red theme too. And just to be clear the jerseys will be worn in Buffalo’s Thursday night game at New York against the Jets. Following the bye, do you think Cyrus Kouandjio played well enough in London to remain the Bills starter at Right Tackle? CB: That is not going to happen as Seantrel Henderson returns to the lineup, but it should be noted that both offensive coordinator Greg Roman and Rex Ryan praised Kouandjio’s play against the Jaguars. Ryan even used the word ‘tremendous’ in describing his play. I think Kouandjio’s play will serve him best next season when the offensive tackle situation could look a lot different than it does now. Cordy Glenn is slated to be a free agent, and will likely be looking for big money. Buffalo can’t keep everybody and knowing the Bills have only bought themselves a year of time making use of the fifth-year option on Stephon Gilmore, who is playing great right now, he’s the priority. Nigel Bradham is also up at the end of the year. So to get to the point here, Kouandjio’s play this year is likely to carry more weight next year when the team makes a decision on Cordy Glenn. If Glenn is not here I think Kouandjio will get strong consideration for the right tackle job with Henderson the most likely option for left tackle. Thank you for all the informative work you do from a long time Bills fan out here in New Mexico. Do you have any insight into how the Bills coaching staff see Marquise as a player? From where I sit he is small and injury prone and because of this I don’t think he has been used appropriately. His asset is pure speed yet he was hurt last year on a pass route that had him stop in the middles of the field (negating his speed asset) and he got his so hard it put him out of the game. This year a crossing pattern again injured his ribs, and then a kick-off return (the most violent play in the game) injured him. Why has the staff not used him speed with downfield routes to pull the defense away from the line of scrimmage? Your thoughts? CB: While I understand what you’re getting at with Goodwin’s body type being susceptible to injury, I don’t know how realistic it is to take the approach that, we’re only going to run Goodwin on fly routes when he’s in the game. I think there is merit to taking him off kick return to reduce the number of violent collisions on him, and I suppose you can have him run more outside routes than crossing patterns. The problem is I believe coaches worry that such an approach quickly becomes easy for opponents to figure out. Perhaps if he’s a role player, which in essence he is, you could limit him to quick outs, comebacks, digs and go routes. But coaches would know better than I would as to whether that’s too predictable and whether or not those limitations would take away from his effectiveness on the field. I suppose the greater end game is to have him available, so at the very least what you’re proposing might be worth a try. That will have to wait until next year however, with Goodwin on injured reserve. The Bills have another bounce back game on the road just like two weeks ago in Miami. Here’s hoping it’s a repeat performance. Here’s your latest edition of questions from email at AskChris@bills.nfl.net and on Twitter at @ChrisBrownBills. 1 – @ChrisBrownBills Is John Miller practicing, playing? CB: Miller practiced all week. He was never full go, but head coach Rex Ryan said on Friday he expects Miller to be back in the starting lineup. 2 – @ChrisBrownBills what’s the word on McKelvin? CB: McKelvin has made some good strides the last couple of weeks. He’s starting to do real football work on the side now with the athletic trainers. He was pulling an athletic trainer while working on his backpedal with straps attached to his body. The athletic trainer was holding the ends of the straps and McKelvin was pulling him down the field. He’s certainly worked hard to get all the way back and I wouldn’t be surprised if he’s practicing again the first week he’s eligible to do so, which is the week leading up to the London game against Jacksonville. Whether he’s activated off the Reserve/NFI list is another story. My question is on Doug Whaley. How do contracts work for GMs? Unless Whaley got fired is it his job forever? I really loved your article about him recently because it shows that he doesn’t want this franchise to be successful for a couple of years he wants to build it into a franchise that competes year in and year out. I’ve been listening to him speak about that in the past and I don’t think most fans really pay attention to what he’s been saying. I really do believe we have a GM and a front office that can make this franchise respectable again for a long time. So, do you think Doug Whaley is here to stay for a long time? CB: I think Doug Whaley is fast proving to be an astute GM who knows how to build a roster for the long haul. General manager contracts work a lot like coaching contracts. They’re just not publicized as much. I think provided the talent that he’s assembled can reach its full potential, Whaley should be building rosters here for a long time. You help keep us fans who live far away up to date, so thank you. My question is about the defense. What has happened to them? Rex said he expects them to be #1 with the roster they have. They stepped up their run defense, but pass has been terrible. We call the front four the cold front, but I haven’t seen anything from them that I’ve come to expect over the last few years. We led the lead in sacks the last 2 years and it seems like a rare occurance if we get one now. Please help me understand what has become of our best asset. CB: First thing to know is the number of sacks a team has doesn’t always indicate a team has a great defense. Perfect example is the 2000 Ravens. They had just 35 sacks, but allowed just 165 points the whole season. That being said, the Bills pass rush has been effectively countered by a quick strike pass game from opponents. Underneath coverage, particularly in the middle of the field has to be better to help the pass rush up front. That is the only thing that will make opponents pull out of their quick pass game. That or keeping them out of the end zone and putting them behind on the scoreboard. Then the passing game will have to open up and call for longer pass routes to catch up in the game. That leads to the QB holding the ball longer and then the pass rush can have the impact it’s designed to have in this defense. When is Goodwin due back? CB: Marquise is listed as probable for Sunday’s game, so I think there’s a good chance he’s dressed for Sunday’s game, especially if Sammy Watkins is down. It’s been a long and arduous rehab back from a pair of cracked ribs for WR Marquise Goodwin. Goodwin has been back practicing the last couple of weeks, but on a limited basis. That was the case again on Wednesday. Goodwin admits with Watkins out of the lineup it has only increased his sense of urgency to be back in the lineup. The Bills look to stack two wins in a row Sunday against the Giants. Here’s your latest edition of questions from email at AskChris@bills.nfl.net and on Twitter at @ChrisBrownBills. With guys like (Alshon) Jeffery and (Victor) Cruz missing multiple games with calf injuries, is there any concern Watkins might also? CB: First, I’m not a doctor, but I have learned through our athletic training staff that not every calf injury is the same, and every player heals differently. Some heal faster than others, some have a higher pain tolerance than others. All that being said a calf injury is a critical problem for a wide receiver. They need it to drive off the line, accelerate, cut, etc. Cruz’s calf injury from most reports is from overcompensating coming off a knee injury that kept him out most of last year and required surgery. I don’t know that Watkins’ injury is related in any way to overcompensating for his hip that required surgery in the offseason. I think we just all hope that Watkins is back in the lineup sooner rather than later. First off, I’d like to give a shout out to Buffalo Bros. on University Ave in Fort Worth, TX. It’s great to watch Bills games on Sundays surrounded by other Buffalo fans. Here’s my question: With LeSean McCoy unlikely to suit up against the NY Giants this week, is it likely that Buffalo considers resigning Bryce Brown? I believe that we have an available roster spot after the Cassel trade. He would be a good compliment to Karlos Williams, whereas Boobie Dixon seems like he’s more of a goal line back and special teams contributor. CB: The roster spot was actually filled by promoting Jonathan Meeks from the practice squad last week, not that it would keep them from making another move to address their running back position should LeSean McCoy be unable to play Sunday. The most logical move however, would be calling Cierre Wood up from the practice squad. He’s been with the team since the last half of training camp and showed some flashes in the preseason. Wood has more of a shifty skill set and good hands for catching out of the backfield. Will this be the week that the #ColdFront starts racking up some sacks? CB: The pass rush always has an edge when playing at home knowing the opposing offense has the added challenge of crowd noise. Manning however, has not been sacked much so far this season, just three times in three games. Ben McAdoo’s offense is designed to get the ball out fast to protect Manning. A heavy dose of press coverage could aid in forcing Manning to pump and double clutch the ball to buy the pass rush an extra half second to get home. Some exotic looks could also cross up Manning’s diagnosis of the defensive coverage and delay his delivery of the ball. In the long run, the Bills afford to play Thigpen. I believe they are other returners the Bills have on the roster. The Bills have specialists already in Gay/Sanborn who play minimal. Thigpen has yet to take an offesnive snap. I’d rather see Goodwin active than Thigpen. I would exepct Goodwin to get looks on offense and can return kicks. CB: Once Marquise Goodwin is healthy I do anticipate he’ll be active. He’s still recovering from a rib injury. Goodwin however, is a kick returner, while Thipen is primarily a punt returner. The kick return job is Percy Harvin’s as of right now. I do believe if Sammy Watkins is unable to play that Goodwin would fill his spot among the receiving corps provided he himself is healthy enough to play. As for Thigpen I think he was fortunate to make the roster as the team’s seventh WR. I believe the main reason he did is because primary punt returner Leodis McKelvin is on Reserve/NFI until Week 7 when he would be able to practice again if medically cleared. When McKelvin returns there will need to be a roster move. Who would you have cover Odell B, Darby or Gilmore? Or should they stay on separate sides of the field? CB: I think Darby has shown well for the most part this season. To this point the Bills have played most passing attacks straight up leaving Gilmore and Darby on their respective sides. Beckham is a unique talent. If the defensive staff decides to have one cornerback follow him the whole game Gilmore is your guy. Beckham’s hands are so strong that you want a corner that can be physical with him not only on routes, but through to the attempt to catch. Darby can do that too, but Gilmore would be the better play if they decide to go that way. The Bills look to bounce back this week and get an important win on the road at Miami Sunday. Here’s your latest rundown of questions from email at AskChris@bills.nfl.net and on Twitter at @ChrisBrownBills. CB: In the wake of sticking almost exclusively with a pass rush of their front four in the first half last week I would anticipate that Rex Ryan and defensive coordinator Dennis Thurman will mix it up a bit more. So while there will be instances where they do just rush four, I believe they will weave in some blitz packages in certain down and distance situations. As for sack totals, the Bills have averaged 4.5 sacks per game in the last four meetings, so you’re likely to see more of them Sunday. CB: Team morale is just fine heading into Sunday. One loss can’t be a soul crusher for any team and that’s certainly not the case at One Bills Drive. The offense is encouraged by the rhythm they found late in last week’s game with three straight touchdown drives in the fourth quarter to make it a game. And for the record Tyrod Taylor confirmed for me that New England was not sitting back. They were playing the same defensive looks that were working earlier in the game. And the defense is motivated to redeem themselves last week as is special teams. So I’m expecting a strong performance. I know the Bills haven’t said too much about Aaron Williams but is it possible he’s back for the Giants game? CB: Bills head coach Rex Ryan said the following about Aaron Williams’ status beyond this week. “Our trainers seem to be very optimistic about him being up for next week, but we’ll see,” said Ryan. Any chance we see mckelvin by the bye week? CB: Leodis McKelvin is doing more and more on the side with athletic trainers during practice. There are still some hurdles for him to clear. I think a safe guess-timate, and it is a guess on my part, that by the week following the bye (Week 9) he stands a good chance of being ready to go in the home game against the Dolphins. Why wasn’t that Steelers player fined for the hit on Goodwin??? CB: I think it’s a valid question. The hit on Goodwin was borderline late number one and second the Steelers player buried the crown of his helmet into Goodwin’s rib cage when he had already gone to the ground. The Pittsburgh player could’ve been flagged for spearing. Had he been then I think a fine could’ve been a possibility, but to my knowledge there was no fine.